شعبان‌علیزاده, فهیمه, دهقانی فیروزآبادی, محمد رضا, کارگرفرد, ابوالفضل, مدهوشی, محراب. (1390). بررسی تاثیرکاربرد الیاف مغز و کل ساقه کنف بر ویژگی‌های تخته فیبر نیمه سنگین ساخته شده از الیاف چوب صنوبر. مجله صنایع چوب و کاغذ ایران, 2(2), 99-110. فهیمه شعبان‌علیزاده; محمد رضا دهقانی فیروزآبادی; ابوالفضل کارگرفرد; محراب مدهوشی. "بررسی تاثیرکاربرد الیاف مغز و کل ساقه کنف بر ویژگی‌های تخته فیبر نیمه سنگین ساخته شده از الیاف چوب صنوبر". مجله صنایع چوب و کاغذ ایران, 2, 2, 1390, 99-110. شعبان‌علیزاده, فهیمه, دهقانی فیروزآبادی, محمد رضا, کارگرفرد, ابوالفضل, مدهوشی, محراب. (1390). 'بررسی تاثیرکاربرد الیاف مغز و کل ساقه کنف بر ویژگی‌های تخته فیبر نیمه سنگین ساخته شده از الیاف چوب صنوبر', مجله صنایع چوب و کاغذ ایران, 2(2), pp. 99-110. شعبان‌علیزاده, فهیمه, دهقانی فیروزآبادی, محمد رضا, کارگرفرد, ابوالفضل, مدهوشی, محراب. بررسی تاثیرکاربرد الیاف مغز و کل ساقه کنف بر ویژگی‌های تخته فیبر نیمه سنگین ساخته شده از الیاف چوب صنوبر. مجله صنایع چوب و کاغذ ایران, 1390; 2(2): 99-110. به منظور کاربرد بهینه مواد لیگنوسلولزی غیر جنگلی ایران، در این بررسی امکان استفاده از الیاف مغز و ساقه کنف به صورت مخلوط با الیاف چوب صنوبر در تولید تخته‌فیبر با چگالی متوسط مورد ارزیابی قرار گرفت. دو سطح چگالی (55/0، 75/0 گرم بر سانتی‌متر مکعب) و سه سطح درصد اختلاط الیاف (50 درصد الیاف صنوبر- 50 درصد الیاف مغز کنف،50 درصد الیاف صنوبر- 50 درصد الیاف ساقه کنف و 100 درصد الیاف صنوبر) به عنوان عوامل متغیر در نظر گرفته شدند. دما و زمان بخارزنی (175 درجه سلسیوس برای10 دقیقه)، دما و زمان پرس (175 درجه سلسیوس، 5 دقیقه)، فشار پرس (30 کیلوگرم بر سانتی‌متر مربع)، رطوبت کیک الیاف (12درصد) و چسب اوره فرم آلدئید با غلظت 50 درصد عوامل ثابت این تحقیق بودند. نتایج این بررسی نشان می‌دهد که افزودن الیاف مغز کنف به الیاف صنوبر سبب افزایش مدول گسیختگی، مدول کشسانی و کاهش جذب آب و واکشیدگی ضخامت گردید. از سوی دیگر تخته فیبر صنوبر- ساقه کنف دارای ویژگی های مکانیکی و فیزیکی قابل رقابت با تخته‌فیبر چگالی متوسط ساخته شده از 100 درصد الیاف صنوبر می‌باشد. در نهایت می‌توان گفت که با توجه به تحلیل آماری، بهترین تیمار در این بررسی استفاده از الیاف مغز کنف در ساخت تخته‌فیبر چگالی متوسط صنوبر با چگالی 75/0 گرم بر سانتی‌متر مکعب می‌باشد. 1- Dix, B., Thole, V. and Martuzky, R., 1999. Poplar and eucalypus woodas raw material for wood- based panels in industrial and uses of fast – grown species: pp. 93-102. 2- Doosthosseini, K., 1380. 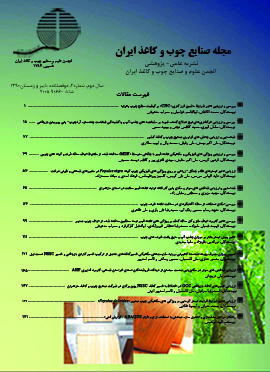 Production Technology and Applicatin of compressed wood plates, Tehran University publication: P 648. 3- European Standard EN 310 ,1993, Wood based panels, Determination of modulus of elasticity in bending strength, CEN European committee for Standardization. 4- European Standard EN 317,1993, Particleboard and fiberboards, Determination of swelling in thickness after immersion in water, CEN European committee for Standardization. 5- European Standard EN 319,1993, Determination of tensile strength perpendicular to the plane of the board, CEN European committee for Standardization. 6- European Standard EN 322,1993, Determination of moisture content, CEN European committee for Standardization. 7- European Standard EN 323,1993, Determination of density, CEN European committee for Standardization. 8- European Standard EN326-1, 1993, Wood based panels sampling cutting and inspection sampling and cutting of test pieces and expression of test results. 9- Fathy­, L., Faezipour­, M. and Bahmani­, M­,. 2011.Effect of UF and MUF resins on the practical properties of particleboard produced from rice straw and aspen particles,Iranian Journal of Wood and Paper Science Research, 33(2): 321-331. 10- Grigoriou, A., Passislis, C. and Voulgaridis, E., 2000. Kenaf core and best fiber chips as raw material in production of one layer experimental particle board. Holz als roh und werkstoff, 58: 290-29. 11- Kargarfard, A., Hossein zadeh, A. and Nourbakhsh, A., 2005. Investigation on medium density fiber board (MDF) properties produced from poplar wood (P.nigra), Pajouhesh & Sazandegi 63: 38-47. 12- Khalili gasht rood khani, A. and Mirzabeygi azghandi, R., 2009. Investigation produce of particle board with use of Bagasse and Haloxylon sp, Iranian Journal of Wood and Paper Science Research, 24(1): 99-116. 13- Nasiri, N., 1387. Light honeycomb panels suitable replacement for MDF and Particel boards, National Conference of supplying raw materials and Wood and paper industries development, Gorgan, Iran, Agricultural Sciences and Natural Resources Gorgan university. 14- Nourbakhsh,A. and Kargarfard, A., 2006. The effects of density and press time on poplar insulatin particle board properties, Iranian Journal of Wood and Paper Science Research, 21(2): 115-122. 15- Ohnishi, K., Okudira, Y., Zhang, M. and Kawai, Sh., 2000. Manufacture and mechanical properties of oriented medium density fiber board from non-wood lignocellulosic fibers, Mokuzai Gakkaishi, 46: 114–123. 16- Okuda, N. and Sato, M., 2005. Manufacture and mechanical properties of binderless boards from kenaf core, Journal of wood science, 50: 53 – 66. 17- Omidvar, A., 1388. Wood polymer composite, Agricultural Sciences and Natural Resources Gorgan university publication: P132. 18- Paridah, MT., Hafizah, AW. and Azmi, I., 2009. Banding properties and preformance of multi-layerd kenaf board, Journal of tropical forest science, 21(2): 122 -133. 19- Sellers, T., Miller, G., Fuller, M., Broder, J. and Loper, R., 1993. Lignocellulosic-based composite made of core from kenaf. an annual agricultural crop, for prod J, 43 (7/8): 69-71. 20- Shigeki, N., Yuzo, O., Kazunori, U., Hideyuki, A. and Wenhai, L., 2006. Structural wall board utilizing kenaf, MEW Technical Report, (54): 10-15. 21- Voulgaridis, E., Passiallis, C. and Grigorious, A., 2000. Anatomical Characteristic And Properties Of Kenaf Steams (Hibiscus cannabinus), IAWA Journal, 21(4): 435-442.